How can local communities gain more control and make input into natural resource management? With the resurgence of violent militant activities in the oil-rich Niger Delta region of Nigeria, lowering oil production and Nigeria’s revenue earnings, how can local leaders resolve conflicts through policy-based negotiations for increased benefits to the region such as social programs, community projects and physical infrastructure? These questions and many more formed the central theme of the town hall meeting Spaces for Change hosted in Nkpanak community in Ibeno Local Government Area (LGA) of Akwa Ibom State on September 28, 2016. 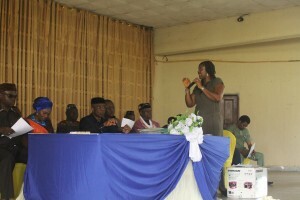 The town hall meeting brought together 70 participants–comprising the Ibeno local government chairman and his wife, the council of traditional rulers, youth leaders, local government personnel, representatives of market women and different interest groups within the state–under one roof to discuss and learn more about the (proposed) changes in national energy policies that have implications on the environment and on host communities. The participants were drawn from 11 communities in Ibeno LGA and other parts of the State such as Nkpanak, Upenekang, Iwoachang, Okorotep, Ntafre, Uponkam, Nnu-Nfere Okure, Atarika, Itak Abasi, Itak Afanja and Inwa Eyet Ikot. Rich in resources, but populated by impoverished inhabitants who face perennial security challenges, the Niger Delta is a compelling example of the resource curse. For instance, Ibeno LGA community hosts the Qua Iboe terminal operated by ExxonMobil, who holds 40% interest in the field production mix with the Nigerian National Petroleum Corporation (NNPC) having the remaining 60%. Although ExxonMobil has operated for 46 years in the community—with its oil production currently averaging 400kbd, held in about 9 crude oil storage tanks with a total capacity of 4.5 million barrels, loading at about 50,000 barrels per hour—public infrastructure and other indices of development are glaringly absent in the locality that hosts the corporation’s four-decade-long exploration and production activities. Over 50 years of oil exploration and exploitation have occasioned environmental degradation, pollution, excruciating and brutalizing poverty, unemployment, disease, health hazards and countless deaths of hapless inhabitants. Piqued by the resulting underdevelopment, environmental despoliation and outright neglect by the Nigerian state and collaborating multinational oil companies (MNOCS) operating in the region, diverse militants groups commenced violent agitations in the late 90s, demanding for cleanup and social change. After 7 years of lull in the violence and considerable peace in the region, militant groups regrouped after Nigeria’s President Buhari terminated the ex-militants’ pipeline security contracts and cut the funding for the amnesty programme in the 2016 budget. Renewed militancy in the Niger Delta has had a catastrophic effect on oil production and the Nigerian economy, forcing the country to go into economic recession in the second quarter of the year. In particular, the resurgence of attacks on oil installations has reduced Nigeria’s oil production to a 22-year low. As the violence escalates, host communities are worse off because the attacks leave huge trails of oil spill and environmental damage resulting from the ruptured pipelines and blown-up oil installations. Oil companies have also beefed up security in and around the host communities, leading to excessive militarization of communities, widespread apprehension and brutality. Recognizing participation as integral to realizing social and economic development in Nigeria, SPACES FOR CHANGE is instituting public discussions with local leaders in the grossly under-developed Niger Delta region, to increase their awareness of the latest developments in the ongoing energy sector reforms, and apprise them of the benefits of certain policy measures that they can invoke to maximize social welfare in their communities. One particularly evident finding from the meeting is that majority of the locals, including the most educated among them, have never heard about the Petroleum Industry Bill (PIB). As such, they never participated in any of the bill passage processes, such as the zonal and national public hearings conducted during the last republic of the Nigerian parliament. 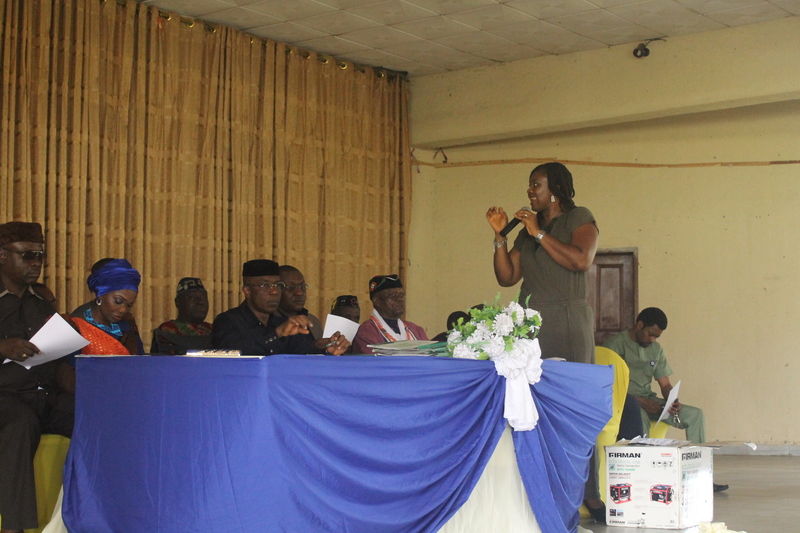 Explaining why majority of Ibeno people are unaware of the PIB, Utiaruk George, the Youth President of Upenekang reasoned that Ibeno community has no representation at the Federal Parliament. The few federal legislative representatives from the state come from the non-oil producing areas, and accordingly, are too far from the realities on the ground. 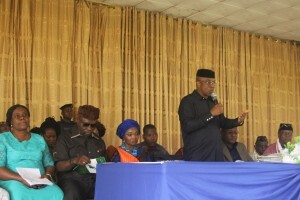 In his opening remarks, the Chairman of Ibeno Local Government Council, High-Chief William Nkpa advocated for an oil bill of rights for host communities. A key highlight of this bill is the establishment of an Oil Commission for Host Communities which would operate like a junior body to the Niger Delta Development Commission (NDDC). But unlike the NDDC that gives the allocation directly to state governors, the Oil Commission would ensure that the allocation is accruable directly to the host communities, and the sharing principle would be based on the quantum of oil contributed by each oil-producing community. One thing that is quite evident in this recommendation is the lack of awareness of the Host Community Fund established under the PIB. The Host Community Fund which is both conceptually and structurally similar to the oil bill of rights for host communities requires companies engaged in oil and gas exploration and production to remit into the fund on a monthly basis, 10 per cent of its net profit. The Fund is to be utilized for the development of the economic and social infrastructure of communities within the petroleum producing areas. In response to the plethora of community concerns raised during the interactive session, SPACES FOR CHANGE’s executive director, Victoria Ohaeri, urged them to explore peaceful means of protecting host communities’ interests through proactive community participation in legislative reforms. She educated them about some of the ongoing legislative developments in the energy sector. For instance, the Federal Government has extracted provisions of the Petroleum Industry Bill (PIB) that deal with institutions, industry regulations and governance, and synthesized them into a separate bill known as the Petroleum Industry Governance and Institutional Framework (PIGIF) Bill. Under this new bill, the Petroleum Host Communities (PHC) Fund is conspicuously missing among the new governance structures and institutional vehicles that will drive the revolutionization of the oil and gas industry. It was again, clear that the locals were not even aware of these developments. Demanding for its re-inclusion could become a rallying point for communities, and a springboard to negotiate for greater benefits for the region through non-violent means. Beyond the demand for infrastructural development, communities can mobilize and push for policy provisions that determine adequate compensation terms in the event of material or economic losses resulting from petroleum operations. The failure to pay compensation could be framed as a ground for suspension or revocation of licenses, or the withdrawal of the social license to operate. A classic example happened when Ogoni Community declared Shell Petroleum Company persona non grata to their community, ending the company’s exploration operation in Ogoniland since 1993. It is hoped that this type of public debate on matters of governance, would bring to the fore, the gaps in legislation, and at the same time, equip locals with the information and resources needed to bolster their effective participation in policy reforms. In 2013, SPACES FOR CHANGE conducted a comprehensive analysis of the provisions of Nigeria’s Petroleum Industry Bill relating to community participation and environmental protection. The analysis was undertaken for the purpose of building the capacity of oil producing communities to understand the PIB, and use its provisions to demand legal protection for their rights to a safe environment, and participation in oil industry operations. Copies of that report, PIB RESOURCE HANDBOOK, were freely distributed to the traditional rulers and local government personnel at the event. In his closing remarks, High Chief Nkpa thanked SPACES FOR CHANGE for all the “eye-opening ideas” and the informational materials donated to the community leaders. 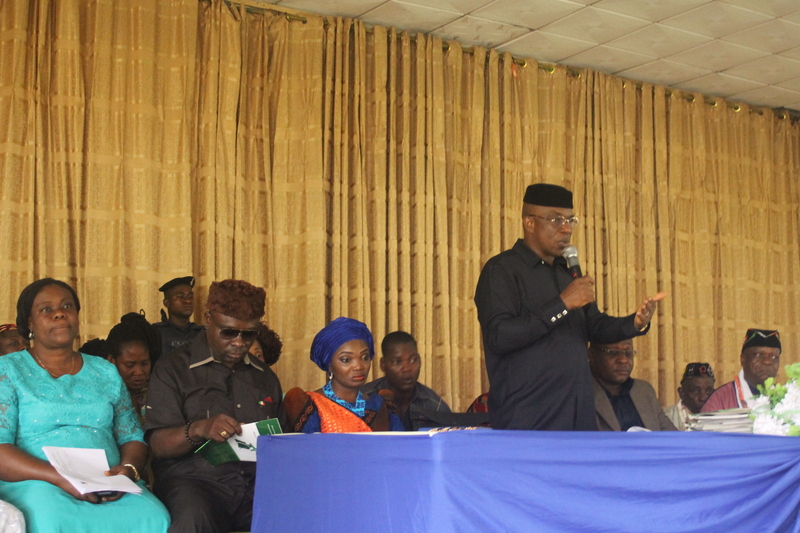 Further, he implored SPACES FOR CHANGE to take steps to extend the capacity-building programs for community representatives to all the oil-producing communities in Akwa Ibom State. 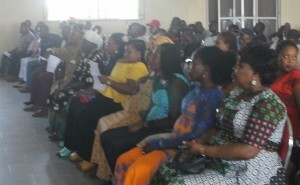 With participation being both a human right in itself and instrumental to the realization of other rights, SPACES FOR CHANGE shall continue to disseminate knowledge to local populations, engage the policy landscape in which these reforms were developed, and create avenues that enable communities to exert influence and make input into processes that determine the way natural resources should be managed. This community outreach program was supported by the Fund for Global Human Rights.